Stoffel Vandoorne interview: "I'm in a great place"
He may not have enjoyed the easiest of starts to life in Formula 1 amid McLaren's ongoing struggles, but Stoffel Vandoorne remains one of the series' brightest young talents, having made a name for himself with a hugely successful junior career. We caught up with Vandoorne over the Canadian Grand Prix race weekend to talk about his future, the waiting game at McLaren, and how life at the team has changed during his time there. Stoffel, you've spoken over this weekend about how the gaps between you and teammate Fernando Alonso have been fine this season, with just 0.009s between you in qualifying. Looking back on your start to the season, are you pretty pleased with how you’ve done? Stoffel Vandoorne: Yeah. Like I said before, I think the statistics are one thing, but the actual reality is another. A lot of the qualifyings, at the start of the season we’ve come out with a bit of bad luck, some things that went wrong that we didn’t have in our own control. Some of the qualifying sessions, we came out and we should have been ahead of Fernando because of some things that happened. I think the gap between us is extremely small. Sometimes a bit of luck is involved as well. I think today showed how close things are when everything more or less runs normally. In terms of your own personal progression as well, can you see a big difference in the Stoffel Vandoorne of 2017 versus the Stoffel Vandoorne of 2018? SV: Definitely a big step forward. Even if you look at this weekend last year, it was probably one of my worst weekends. In terms of pace compared to Fernando, I was lacking a lot, I was quite a bit off. To turn that around this year has been a massive step forward. I’m much better prepared going into every weekend now. I know what to do with the car and know what to do with myself to get the maximum out of the package we have. I think the gap last year was about five or six-tenths. It’s been a good step forward. I’m feeling much more comfortable with the next couple of races as well. Race after race, this year has been small step forwards, and really understanding Formula 1 a bit better. People like Fernando, they’re never leaving anything on the table. He’s one of the drivers that has now 17 years of experience, 300 races. He’s been through this process in the past already. You feel his experience definitely helps to become better. Do you feel you’re not getting enough credit in how you're performing against Fernando? He’s widely recognised as being one of the best of his generation, and you’re taking the fight to him. SV: It’s hard to tell. I think a lot of things in Formula 1 are always a bit of a perception. I think if the car would have been a race-winning car, then I think a lot of the stories would have changed. 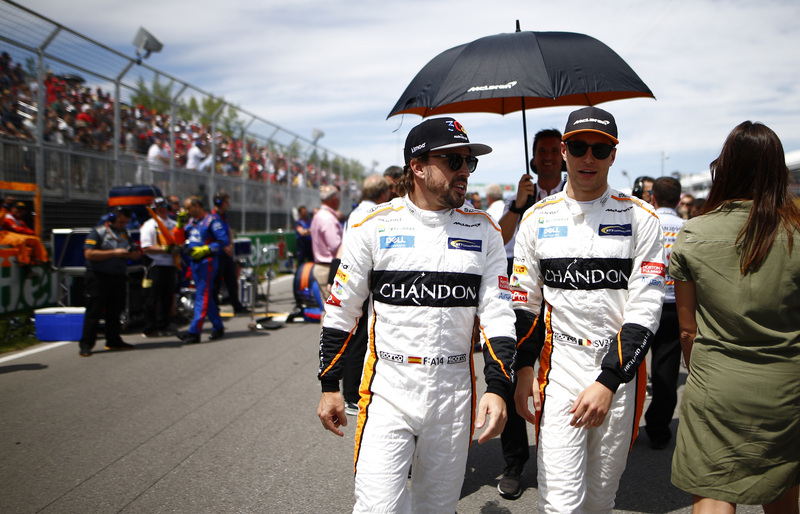 I think on one side, it’s a bonus to have Fernando next to me because he’s a known value in the paddock. Everyone knows he’s one of the best drivers around. For me, the only thing I can do is to be as close as possible to him. There’s a lot of talk about Alonso’s future and your future as well. If Fernando were to step out of the team, do you think you could take the lead? SV: First of all, this is a decision for Fernando that he will have to make in the future. It’s not something that is in my control. The only thing that I can control is my own performance and my own results. I think given how closely-matched we are and the direction we’re going in the team, I feel absolutely 100 percent ready. There’s no doubt there. Is there any pressure for you and your own future as you wait for Fernando to make a decision, or do you feel that you’ve got your future in your own hands? SV: I don’t feel any pressure at all. The results this year have been positive. At the moment there’s not much more I can do apart from driving at my best and trying to make the most at what we have. Starting in F1 with quite an uncompetitive car does maybe change the perceptions you mentioned. Was that tough coming from junior formulae where you’d had success in everything you’d driven? SV: It’s definitely a different approach. I think especially the first year was a bit more difficult, especially at the start. Like you said, during my junior career I’ve had very good moments. OK, there were some bad moments, but I wouldn’t say I’d ever been in such difficult situations. I think in a way, it made me a lot stronger to try and deal with certain problems, to go into a race weekend differently and try and maximise everything that you have. Even though the car we know isn’t maybe always capable of scoring points, to still try and extract the maximum out of that is not a given. It’s a different mindset I would say, but it made me a stronger driver. SV: Yeah, I guess it is. Like Fernando said, I think today at some of the grands prix, some of the results have been quite predictable. If nothing happens on-track, if no incidents happen, then a lot of the grid positions are usually locked out by constructor order more or less. In a way, that is a bit of a shame, but I think this is Formula 1 as well. It’s always kind of been a bit like this. As the regulations move forward, hopefully there will be a bit of a change to that. Going through all of this, when - and I said ‘when’, not ‘if’ - McLaren gets back to the top, will that make it all the more sweeter? SV: Oh for sure. It’s always nice when you go through a difficult time, and then when you reach success again, it’s a very nice feeling. I can only hope that feeling comes back very soon. You’ve been here for a long time, even pre-Honda, so do you feel a greater attachment to this whole project as well, going through that rebuilding process? SV: Yeah definitely. I’ve been part of McLaren for a long time now. I’ve been through a couple of difficult years. I didn’t really experience the good years with McLaren, so I can’t really tell how they are. I’ve been through a couple of difficult years with Honda where the competitiveness wasn’t great. I think this year has been a step better, and we’ve been making small improvements. I’m sure with all the work I’ve been doing since, the day we will get some success, it will be a very nice feeling. Can you describe to us how the working relationship has changed working from Honda to Renault? There’s a different mentality and different people I assume? SV: Yeah, it’s quite different. I think the first disappointment is that I don’t get to eat sushi any more at lunch! That’s it! The rest is OK. The language obviously was a big difference in terms of communication. Was it that hard communicating with the Japanese team members? SV: It wasn’t always easy to get a good communication with them. The cultural difference between them is very different. I think both have their positives. Another shift that’s happened during your time at McLaren is going from Ron Dennis running the team to now having Zak Brown and Eric Boullier in charge. What kind of differences do you see in their management styles, and how have you seen the team change in that time? SV: Yeah there’s been a lot of change since I joined McLaren. Even Martin Whitmarsh was there in the beginning, then there was Ron, and now there’s Zak. I think in a Formula 1 team, ultimately that’s kind of normal. It happens in every Formula 1 team that there is change. It’s not necessarily a bad thing. It’s a positive thing. I feel we are moving forward. The situation is good now. I have a very good relationship with Zak. What is good is that if you have any issues, you can go into his office and have a proper chat, and I feel that’s the way it should be. If something is bothering you, you shouldn’t be afraid to talk to someone. I think that’s good. Zak is exploring avenues in other series such a IndyCar and Le Mans. Is that exciting, to see the McLaren brand moving beyond just F1? SV: Yeah, I think McLaren is definitely looking into different things. I don’t know exactly what the plans are. It’s not something for me to look into as well. My priority is Formula 1, and this is where I want to achieve the best future. I think for McLaren as a brand, I’m sure it will be something good. By focusing on other series, there’s a suggestion McLaren may lose focus over time on the performance here in F1. Are you afraid that might happen? SV: Not at all. I think McLaren is a very competitive team, and a very professional team in that area. If they would enter into any other series, this would have absolutely zero impact on the Formula 1 team, because it’s simply different people that would take care of it. I don’t see it as an issue at all.